An inventive metafictional novel, in which a drug-dealing biker must solve his own murder from beyond the grave. Thumb Rivera is in a bind. A college dropout, aspiring writer, smalltime marijuana grower, and biker club hang-around, Thumb finds himself confined to his rural ranch house in the desolate Maine countryside, helpless to do anything but watch as his former friends and housemates scheme behind his back, conspire to steal his girlfriend, and make inroads with the Blood Eagles, a dangerous biker gang. A ghost forced to haunt his survivors and reflect back on the circumstances that led to his unsolved murder, Thumb discovers he has one channel through which he can communicate with the living world: Ben, an unemployed ghost hunter. Ben soon convinces local curmudgeon Fred Muttkowski, failed novelist turned pig farmer, to turn Ben’s Ouija-board conversations with Thumb into an actual book. Thumb has two things on his mind: To solve, and then avenge, the mystery of his own violent death, and also to tell his story. 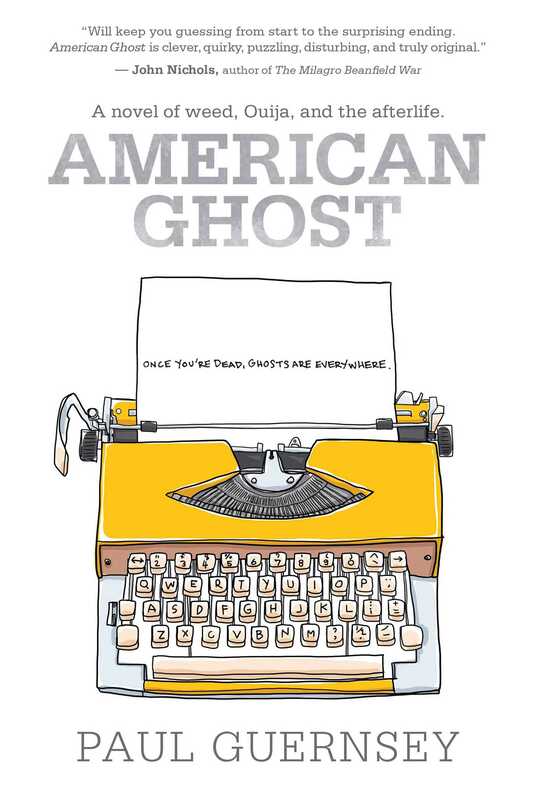 That story is American Ghostas told to Ben, then fictionalized by Fred. It's at once a clever tale of the afterlife, a poignant examination of the ephemeral nature of life, and a celebration of writing and the written word.